Governments can improve the livelihoods of female street vendors by creating safe public spaces and supporting member-based groups of informal workers. Photo by Jeff DeMaria/Flickr. The informal economy is often referred to as the “shadow economy,” a glaring indicator of its absence from the eyes of policymakers. As discussed on TheCityFix, street vendors are frequently ignored in surveys of jobs and economic productivity, despite their extensive connections to the formal economy. Further, the specific challenges faced by female street vendors are mostly absent from public discourse. Street trading is vital to livelihoods of the urban poor, especially women. According to the World Bank, the informal sector accounts for well over half of all urban employment in Africa and Asia and a quarter in Latin America and the Caribbean. In several African countries, informal sector income accounts for over 40 percent of total urban income. By supporting street vendors, cities can foster equitable development and improve the livelihood of society’s most vulnerable populations. Cities can take a number of measures to improve the lives of street vendors, including using public spaces more efficiently and upgrading infrastructure for vendors. However, policymakers must also acknowledge challenges that are particularly acute for female vendors and prioritize solutions that specifically address these challenges. In general, women are overrepresented in the informal economy, though the gender balance of street vendor populations varies widely between continents, countries, and even between nearby cities. 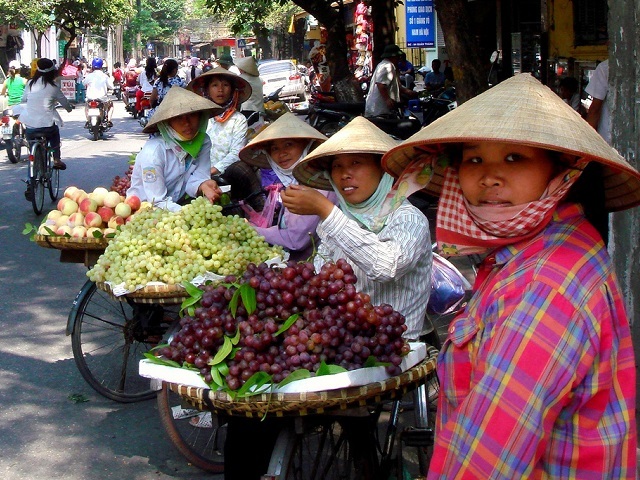 In some places, like Hanoi, Vietnam, 79% of street vendors are women, while in Buenos Aires, Argentina the total is 29%. In Ahmedad, India, women only account for 10% of street vendors. Regardless of gender, street vendors face the challenges of low, precarious income, poor work conditions, and a lack of legal protection. However, these issues are especially prevalent for female vendors. Further, women are frequently less secure in public spaces due to safety concerns. It is crucial for policymakers to acknowledge and address these challenges. Two strategies that have successfully supported female vendors are prioritizing crime prevention in public spaces and supporting member-based vendor organizations. Some cities are acknowledging the economic and social benefits of including female vendors in participatory city planning for urban design. A recent article on TheCityFix shared the results of a workshop conducted in India regarding women’s safety in public spaces. The results showed that, to an alarming extent, safety concerns govern the way women interact with public spaces. This is particularly problematic for street vendors, whose livelihoods require frequent use of potentially unsafe public spaces. The Violence Prevention through Urban Upgrading project in Cape Town, South Africa – executed by a partnership of organizations working to end gender violence in Khayelitsha – demonstrates one way cities can create safe public spaces for women. The program combines a participatory planning process with urban design solutions aimed at reducing crime. For example, it included the creation of well-lit routes through the Khayelitsha township and community-managed “safety boxes” that are always occupied. The plan also provides infrastructure and added space for street vendors. According to the OECD, after the project was completed, the murder rate in the area dropped by 33%. ActionAid Ethiopia (AAE) is also heading a collaborative project that aims to make public spaces safer and more empowering for female street vendors in Addis Ababa. The project brings together urban design professionals to work with female vendors and build alternative designs for public spaces and to design portable, lockable vendor stalls for female vendors. With explicit attention to their needs and the creation of a safer environment, female street vendors can conduct business and occupy the street safely. Organizing and supporting member-based groups of informal workers can also help create economic opportunity and improve street vendors’ livelihoods. These groups can be particularly helpful for women facing legal and economic challenges. The most prominent and compelling example of such a group is the Self-Employed Women’s Association in India (SEWA), a trade union of over 960,000 women in 14 Indian states. Approximately 11% of members in the group’s home state of Gujarat are street vendors. The association aims to benefit its members economically and socially by providing supportive services like savings and credit, health care, child care, insurance, legal aid, and skills training. Its size and history also allow it to be a powerful voice advocating for informal workers in public policy debates, and to train its members to advocate more effectively. While SEWA is a promising example, most vendor organizations are local and fragile. Municipal governments should support vendors’ efforts to organize and provide a defined interface with such organizations so vendors can engage in dialogue with governments. Finally, governments should include such groups as prominent partners when making decisions about street trade and public space. Not all visibility from policymakers benefits street vendors, who can be victims of a predatory state that demands bribes, harasses vendors, and evicts them without consultation. However, through participatory planning, support for safe spaces, and support for member-based groups, cities can acknowledge and address challenges female street vendors face, while building safer, more inclusive communities.